Mark and I are in the research stages of putting together a very small solar backup for use during power outages, and I'm hoping that some of the more technical folks among you can give us the benefit of your wisdom. During three power outages over the last few months, we've figured out that running the generator for an hour a day keeps the farm ticking along, but that we miss two major creature comforts --- lights on winter evenings and more steady access to the internet. Luckily, these gadgets don't draw much juice --- about 25 watts apiece for our laptops, another 23 watts for the router, and 13 watts for a CFL. We figure that if we increase efficiency by buying a car charger for the laptops (deleting the inefficiencies from converting DC to AC to DC) and buy a couple of DC LED lights, we could coast along on very little electricity, allowing us to work and play online for perhaps 3 hours per day on a solar system costing less than $300. 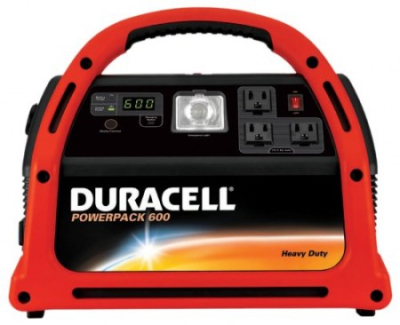 A simple solar system that doesn't seem to require much technical know-how consists of a 600 watt Duracell Power Pack (basically, a 12 volt, 28 amp-hour, AGM battery; a controller; and a 600 watt inverter combined into one unit, costing roughly $125) along with a 25 to 30 watt solar panel (roughly $150.) Many solar panels come with the right connectors, so the system would be basically plug and play. 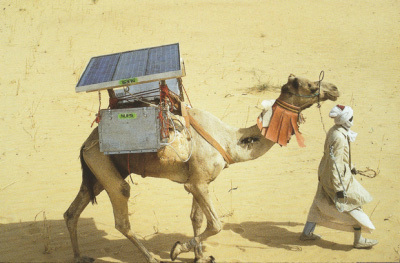 The flaw I see in the combo above is that the solar panel might not fully charge the battery in a single day of sun --- some websites say the system will charge up in 5 to 7 hours, but other sites think the system will take 16 to 18 hours to charge. We can't just add a larger solar panel for quicker charging since the manufacturer notes that you can't hook a panel larger than 30 watts directly to the power pack without adding an external charge controller. Is it okay to shop around and find the cheapest 30 watt solar panel, or are cheaper solar panels going to burn out quickly? Are there solar panel categories I should be aware of in the low end, consumer market? We're willing to pay a bit extra for plug and play (and portability), but don't want to be seriously ripped off. Would it be smarter to do more research and buy the battery, inverter, and charge controller separately? If we bought an external charge controller and a 50 watt solar panel, would the larger panel charge our power pack faster? My very vague understanding makes me think it wouldn't, that the charge controller would just filter out the extra power from the larger solar panel since it's more than the battery can handle. One website notes that this system would give us around 160 watt-hours per day. I'm not actually sure where people came up with that figure --- does it make sense? Does that mean that I could run a single 25 watt laptop for 6 hours? Basically, these questions all come down to one major one --- is this a bad idea? We like the modular nature of the system, especially since Mark thinks we could use the power pack with pedal power, a bit like this article describes. But we don't want to spend a few hundred bucks on a dud. DIY types will enjoy our homemade chicken waterer kit that allows you to build your own automatic chicken waterer in less than an hour. Backwoods Solar offers free custom design and sells custom made systems. You might want to check them out: www.backwoodssolar.com 208-263-4290 From my contact with them I think they're dedicated, reliable folks. Their web site points out there's a 30% federal tax credit for solar. You need to research how many sunny days you average there. Even without sun you get some solar gain, but this is research and math you might want to do now. 160 watt-hours per day would be 6 hours sun, which is probably about right for here, in summer. (Based on maps in a backwoods solar catalog I have.) Half it for winter. 600/160 = 3.75 days to charge the battery. 7 days in winter. Is it okay to shop around and find the cheapest 30 watt solar panel, or are cheaper solar panels going to burn out quickly? It has to be cheap somewhere. It could be in efficiency, longevity, build quality or all of them if you are unlucky. You know; "good, fast, cheap: pick two". I'd do some research, visit solar panel user fora etc. Check what guarantee the manufacturer offers. Take into account that you want to leave them outside year round. So moisture proofing is important, as are proper connectors. Would it be smarter to do more research and buy the battery, inverter, and charge controller separately? That's what I would do, I think. But then I'm a technogeek. I did a solar power project for my B.Sc. 17 years ago; that was good fun. And I've never lost my interest in solar power, so I try to keep current in the technology. The panels have improved but the fundamentals haven't changed. Feel free to ask if you have questions. I would advise you to go and talk to someone who builds and sells these systems, and not buy the parts at wal-mart. They can probably give you a good advice on what & how much you need given your power requirements. This will cost you more, but you can profit from their knowledge and experience. It doesn't hurt to ask for a quote. If you go down the buy-it-yourself route, keep in mind that next to a charge controller you'll also need a maximum power point tracker. (The panel needs to be kept at a certain voltage to generate its maximum power!) But that might be built into the controller. If we bought an external charge controller and a 50 watt solar panel, would the larger panel charge our power pack faster? It would depend on the type of battery. Some types can cope with rapid charging better than others. Keep in mind though that a 50 Watt panel means 50 Watt peak; when irradiated with a full 1000 W/m2 of sunlight perpendicular to the panel. This will probably not occur very often or long, depending on at what angle and orientation you fix the panels, and how sunny it is. One website notes that this system would give us around 160 watt-hours per day. I'm not actually sure where people came up with that figure --- does it make sense? Direction and inclination of the solar panels. How clean the panels are (you want to put them somewhere where you can clean them!). Efficiency of the panel in less than full sunlight conditions. Efficiency of the maximum power point tracker and charger electronics. Basically, you'd have to ask around what other people's experiences are. I don't see manufacturers providing much relevant data. Does [160 Watt-hours] mean that I could run a single 25 watt laptop for 6 hours? The Duracell battery pack is 12 V, and can hold 28 Amp. hours. So that's 12x28 = 336 Wh. Considering your total load of 25+25+23+13 = 86 Watts, a 336 Wh battery would last (336/86=3.9) just under four hours. You'll need a way bigger battery pack. Especially in winter when irradiation is low, you might need several days to recharge the batteries. Keep in mind that a battery is a replacable item! Curent Li-ion batteries are good for about a thousand charge/discharge cycles. So you'd have to replace them in a couple of years. Daddy --- Thanks for hunting down that company for me! I'll have to take a look at them, although I suspect they're like all the other companies in that they sell multiple thousand dollar systems and nothing for a basic, cheap backup. Good reminder about the tax credit --- I knew and forgot. I should factor that into my cost and maybe spend a bit more. Roland --- I wrote this post mostly to get feedback from you, so I'm glad you chimed in! I need to digest your comment before I say anything more, though, so just THANKS! Please let me know what you guys decide, I would love to know what you decide on and how it works for you. I definitely will, Allison. I figure we're not the only ones who want something simple and small that doesn't require too much technical know-how! So Roland confirms something I thought but was not 100% sure about (converting amps and volts to watts always trips me up mentally): The battery in that "600 watt" power pack does not provide 600 watt hours of output. In my 2006 Backwoods Solar catalog, prices for a full system start at $800 (for a 65 watt panel, a couple batteries and controller) and go way up. Take the total watt-hours you need per day, and divide by 6 (for 6 hours sunlight) to get the number of rated watts of solar panels you will need. Let's say you want 200 watts per day; you need 33.3 watts of panel. Add 50% more watts to deal with "solar panel derating" (ie, panels only produce their rated numbers in ideal conditions) and power conversion loss. In your example, we're now at 50 watts. Now add another 50% to 100% to the total to make up for cloudy and winter days. For the SW Virginia area (as well as most of the South), they suggest adding 33%. There is a troubling nearby patch over most of Tennessee (excluding the NE tip) where they suggest adding 60%. So I've been using 50%. So in your example, somewhere between 61 and 66 watts. The numbers I've heard for solar panel degradation over time is they might lose 10% over 10 to 20 years. I'd like some more detail in this area as I will soon be using a decade old 256 watt PV array. Battery degradation is much more of a concern though. Joey -- The 600 W rating is the maximum power output of the battery. But with the capacity of 12 V x 28 Ah = 336 Wh, pulling 600 W from the battery would deplete it in about half an hour! Modern panels shouldn't lose more than 15% of their power of their 25 year lifespan. Batteries will indeed be a bigger worry (and costly. I figure you'll be replacing them every three to five years). You should also consider using an inverter to generate AC and then deliver power back to the net. This would reduce your electricity bill and would use your panels when you aren't. I don't know what your local regulations are and what price you'd get for your generated energy, but it might be worthwhile to find out.